(a) Remove the 2 nuts and upper brace. (a) Using a socket hexagon wrench 5, remove the 3 nuts. (b) Remove the V-bank cover. (b) Remove the fuel vapor feed hose from the 2 hose clamps. 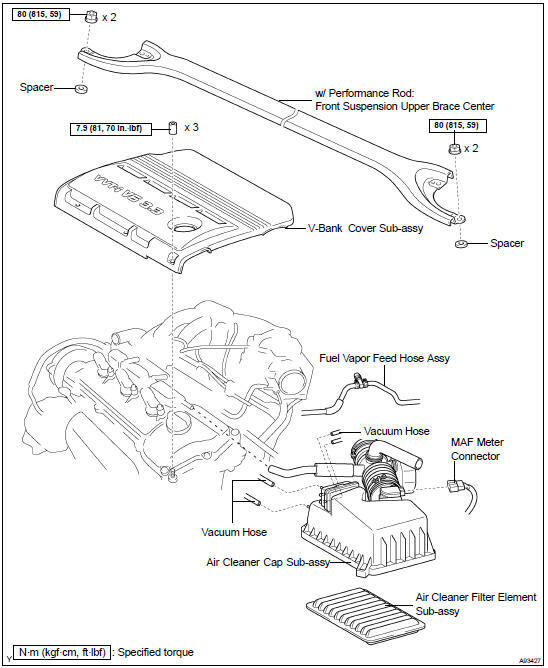 (c) Loosen the air cleaner hose clamp bolt, and then remove the intake air resonator. (a) Disconnect the throttle control motor & throttle position sensor connector. (b) Disconnect the water by-pass hose No. 2. (c) Disconnect the water by-pass hose No. 3. (d) Remove the 2 bolts, 2 nuts and throttle body. (a) Install a new gasket to the intake air connector. (b) Install the throttle body with the 2 bolts and 2 nuts. 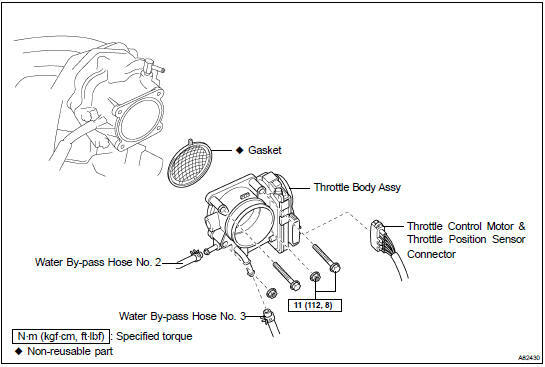 Torque: 11 NVm (112 kgfVcm, 8 ftVlbf) (c) Connect the water by-pass hose No. 3. (d) Connect the water by-pass hose No. 2. (e) Connect the throttle control motor & throttle position sensor connector. (a) Fit the 2 retainers and install the V-bank cover. (b) Using a socket hexagon wrench 5, tighten the 3 nuts. (a) Install the upper brace with the 2 nuts.